For the past 4 days, the weather has been seriously warm. And with the temperature exceeding 30°C with sweltering sunshine, I finally wanted to cook with basil. In my kitchen, I usually try to cook with the season’s ingredients. The other day, I was thinking about food pairings, especially with herbs. For example, it’s rare that there are autumn or winter vegetables that match well with soft herbs like chervil, dill, tarragon, basil, or mint, but on the other hand, sturdy herbs like rosemary, sage, thyme, or bay, go better together with these vegetables. Let me give you some specific examples; basil goes well with tomatoes, strawberries, capsicums, and zucchini, which are summer vegetables. But, it’s not such a good pairing with to earthy tasting, hearty cold weather vegetables like pumpkin, squash, parsnip, or cabbage. Now summer is finally upon us here, I started craving basil, which hasn’t happened in many months for me. Peas are one of the first summer vegetables you can find and basil and mint are natural pairings. Unfortunately, it’s very hard to find fresh local peas. I bought some once years ago but I haven’t been lucky since. If you are buying fresh peas, it’s important to buy the ones from your local farms, as the sweetness of the peas starts to diminish quickly after they are picked. Here in this recipe, I have used frozen peas. I know using frozen vegetables might not sound too “foodie”, but peas are about the only frozen vegetable you would find in my freezer, and I find they taste actually quite similar to freshly podded peas. This dish I made for lunch today is easy and quick to make. It is delicious served either hot or cold, so depending on how hot it is outside, you can give it a ring of change in the dish’s temperature too. If you are looking for another recipe for a hot day, the recipe I submitted, cold beetroot and yoghurt soup, for the Guardian won the Reader’s Recipe Swap two weeks ago. Click here to see the full recipe. Have a nice week guys! xo-A. Note: This dish can be served either hot or cold. 1. In a small saucepan, bring the lightly salted water to boil. Add the peas, sliced leek, and garlic. Boil for 1.5 mins. Drain and refresh under cold water. Drain well and add to the food processor. Add the herbs, olive oil, lemon zest and juice, and salt and pepper to taste. Blend until roughly pureed. Set aside. 2. Bring a large saucepan with generously salted water to boil. Cook the pasta until al dante. Drain. Refresh under cold water, if serving cold. 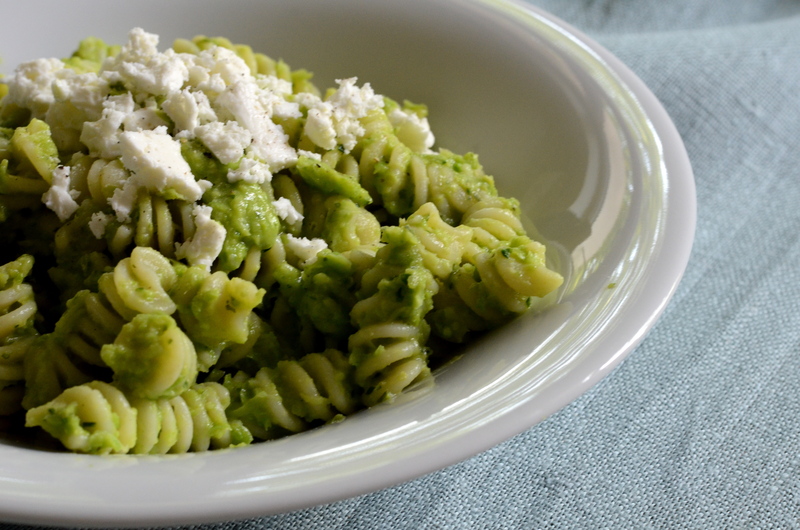 Stir in the pesto and serve with some feta cheese on top.